For the kids having off of school most of this week, I sure haven’t gotten much done in the way of sewing! I did manage to find a nice ‘performance knit’ material (nice weight and stretch\recovery) for the Yoga Mom pants. I have to admit, I almost chickened out in working with this pattern all together because I thought that I had Jalie 3022 (apparently I don’t own that one after all) and I generally have great success with Jalie … With that said, I’m forging ahead with the Yoga Mom anyway. Wish me luck! This entry was posted in Uncategorized on February 27, 2015 by stacy. 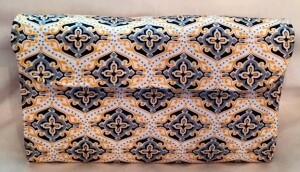 A beautiful new freebie from U-Handbag: The Hepburn Bag. Sweatpants getting too short? Transform them into an adorable kangaroo pocket skirt. In case you missed it, I have a new tutorial up at WeAllSew – this one will actually save you money! Winter weather have your kids trapped inside? Give them a cute place to retreat to with this easy fabric playhouse tutorial. A traditional looking vest for boys can be sewn in a reverse print for a more ‘fun look’. This cute little bow tie would make a cute addition to it, too! I’ve never thought of using chiffon for a cardigan, but it definitely gives a light, springy feel to your wardrobe. Learn how to make your own here. Tired of tablecloths that always scoot around? Now you can make one that stays in place. This tote will keep all your belongings dry in rain, snow, sleet or hail! Turn some of your favorite scraps into a pretty clutch. Grow your own fabric in your kitchen. I am totally intrigued by this and would love to ‘feel’ the finished product. Easter may be several weeks away, but it’s not too late to start stitching up a few of these bunny treat bags, sock sheep, and felt Easter bunnies. There’s no reason for cold feet while you work, just whip up one of these foot warmers for under your desk! Quick! Download you free baby dungaree pattern – available for one week only! This entry was posted in Uncategorized on February 26, 2015 by stacy. Even though I’m a bit slow to sew the patterns from each issue, I have to admit, I have loved Seamwork Magazine so far. My most recent project? The Manila leggings. This adorable pair of comfy pants has a pretty tulip edge cuff that sets it apart from anything else in my wardrobe. It was easy to sew and I whipped this pair up in about an hour…. 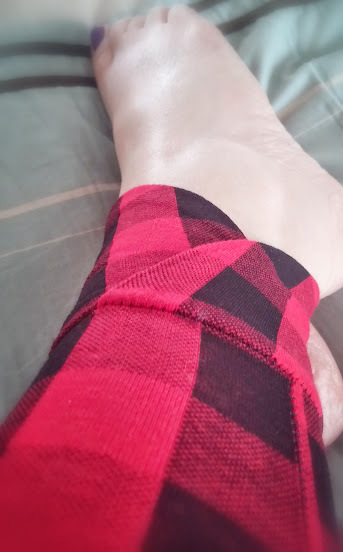 Unfortunately, they are not the most comfortable pair of leggings I own – the buffalo plaid material had the bare minimum of stretch required (you need to have a 4-way stretch fabric) so they feel more snug than what I’m used to. Plus the plaid is difficult to keep straight when you’re wearing the leggings and that drives me crazy. Consequently, this pair of pants may never be worn outside my house and the next pair I make will be a solid (or a not so defined print)! This entry was posted in Uncategorized on February 25, 2015 by stacy. Even the newest of homes can feel drafty during winters like these. How can you keep the cold out, save energy\money, and make a coordinating\decorative piece all at once? With my latest tutorial at WeAllSew – The Draft Dodger! 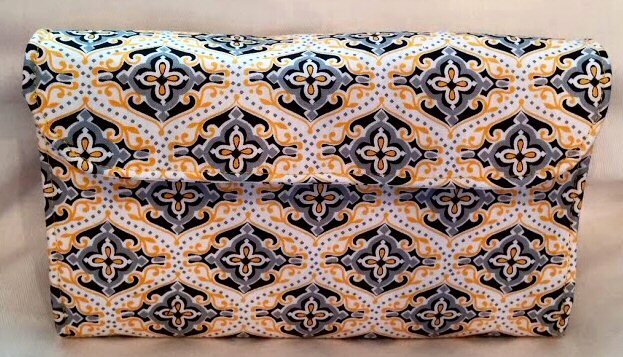 This project only takes 3/8 of a yard of fabric (piping is optional), a bit of fiberfill, and a few cups of poly pellets (this adds weight to the pillow so it doesn’t move out of position easily). 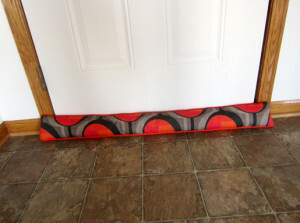 The finished size will fit most standard doors, but can easily be adjusted for windows, sliding glass or french doors. Try one out for yourself and see the difference it can make in your home! This entry was posted in Uncategorized on February 24, 2015 by stacy. In between the hub-bub of the weekend, sick children, and my mom’s surgery, I did manage to sneak into the sewing room for a bit to work on a tester pattern for Hey June. 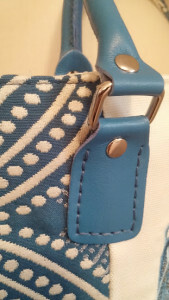 While I can’t show you exactly what I worked on, I can give you a glimpse and say that I am already in love with what I’m sewing up and I may be addicted to metal zippers (there is something very satisfying about ripping the teeth off with nipper pliers). I have also managed to tape together Peek-a-boo Pattern’s Yoga Mom pattern and am debating what length to sew: Should I make the long style since there is no end to winter in sight or jump ahead to the capri in hopes that spring is right around the corner (in all actuality, I’ll probably make both soon)? This entry was posted in Uncategorized on February 23, 2015 by stacy. Now your cosmetic pouch will stay open until you close it – The Retreat Bag uses a wire frame to keep your bag in position while you use it. Tired of sore knees during bath time? 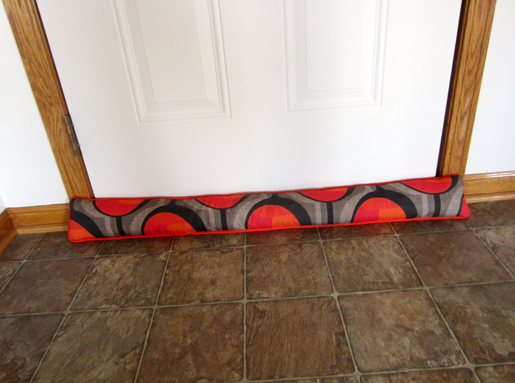 Make a pretty tubside mat to cushion your gams! Create a cozy reading corner with a woodland them with this adorable Log Slice Pouf. The cutest little felt cupcake pattern – perfect for gift giving, decoration, or a fabulous new pincushion. Speaking of pincushions – how about this adorable little bird? 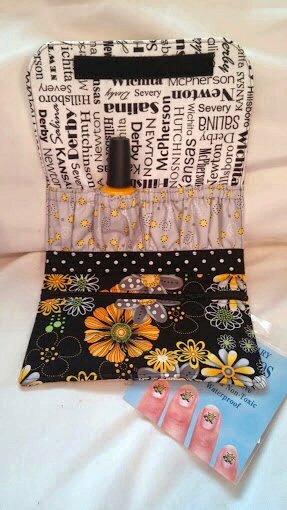 Keep all your important sewing tools at your fingertips while staying organized – just whip up one of these hanging pocket organizers. Then use the same idea to stash your jewelry with this tutorial. Upcycle a men’s, button down shirt into an adorable apron. Say what you will about them, but fanny packs are the perfect way to carry your belongings hands free…. plus I’ve seen celebs sporting them recently too (do I sense a comeback?). Learn how to make your own ‘modern’ version here. Make nap time more fun with a snap up sleeping bag. Carry “Just The Essentials” with this mini tote bag\hipster. This All-In-One Changing Mat is perfect for on-the-go diaper changes or a great baby shower gift. Not sure what to do with your wool scraps? How whipping up a few braided cuffs? No more burning your hands when taking hot bowls out of the microwave when you sew up one of these bowl potholders…. they have handles! This entry was posted in Uncategorized on February 19, 2015 by stacy. It seems as if there is no end in sight to winter so it only makes sense to continue sewing for the season. My latest project is a second Oslo cardigan (you can see my original version here). 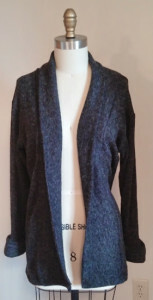 This time around I used a Charcoal & Teal Cotton Wool Hacci Sweater Knit from Girl Charlee. After receiving it, I noticed that the teal is only visible from the right side of the fabric – since I was pretty sure that I would never find anything that would ever match it, I decided to use the ‘wrong’ side of the material… not only was it ‘fuzzier’ and more sweater-like, it is predominately gray\black so I know I have plenty that would go with it. Unfortunately, the end result isn’t as stellar as my first Oslo – in fact, I sort of look like I should be cat hoarder when I wear it. … it’s just sort of dowdy on me. I’m definitely going to have to find something to go with it that will perk this style up some. I also made several ‘mistakes’ when sewing this pattern: My first suggestion? NEVER CUT FABRIC WHEN YOU ARE ENGROSSED IN A TELEVISION PROGRAM. I wound up cutting the collar with the stretch going the wrong way. Fortunately that was the best piece to cut incorrectly because it really doesn’t effect the wearability of the garment (the rest of the pieces have plenty of stretch) and because I had enough material to work with to cut the rest of the jacket. Secondly, I had the intention of folding up the hem of the collar to make a professional looking edge, but was so concerned about the collar piece fitting correctly because I cut it wrong that I completely forgot….. so instead of having a smooth, finished edge, I opted to fold up the hem. It works because the material is so fluffy that the fabric and stitches just sink in and isn’t that noticeable. At least everything panned out well in the end! This entry was posted in Uncategorized on February 18, 2015 by stacy. I can safely say I am in love with (pre-made) leather bag handles. I’ve been itching to work with them for ages, but never had the excuse…. until now. While these handles are at times difficult to find (especially in certain colors), I found a pretty good selection on Etsy (I used this seller because they were the only ones with this shade of blue). Attaching them was a piece of cake too – all it takes is a double strand of heavy duty thread and a backstitch to keep them in place… and the results are very professional! Now I’m feeling the urge to make more bags – I’m pretty sure I see a Wonder Woman version (with a matching wallet) in my very near future! This entry was posted in Uncategorized on February 17, 2015 by stacy. No, your eyes are not deceiving you – things do look a bit different around here! We changed servers over the weekend and have managed to move all the content from the previous site over, but none of the logos, etc. have been added. But, I’m sure you don’t want to hear all about that, I’m sure you want to see…. projects! 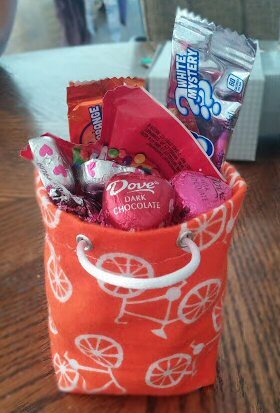 Since Valentine’s Day is over, I can finally show you what I worked on… but first, check out this cute little bag my daughter made (in sewing class) this week. She enjoyed sewing this one up (and found it quick and easy, too) so she made a second one for Easton. Unfortunately I don’t have a link for the tutorial, but I love the idea of these little treat bags. As for me, I made Taylor a Snappy Mani Pouch. Since she has decided that she will be going to WSU next year for college, I decided to make it “Shocker” themed. Unfortunately, unlike other Kansas schools, Wichita State doesn’t have it’s own material (I’m guessing because no one quite knows what a WuShock really is (and frankly, he’s kind of scary looking), so I opted for a gold\black color scheme and found a fun print with Kansas cities printed all over it. This was my third time sewing this particular project and every time I make it, I love it more. The only down side? If you opt to buy fat quarters, you’re going to have a lot of left-over material from it – not quite enough to do much with other than make a few more of these bags….. maybe that’s my excuse to make one for myself! This entry was posted in Uncategorized on February 16, 2015 by stacy. 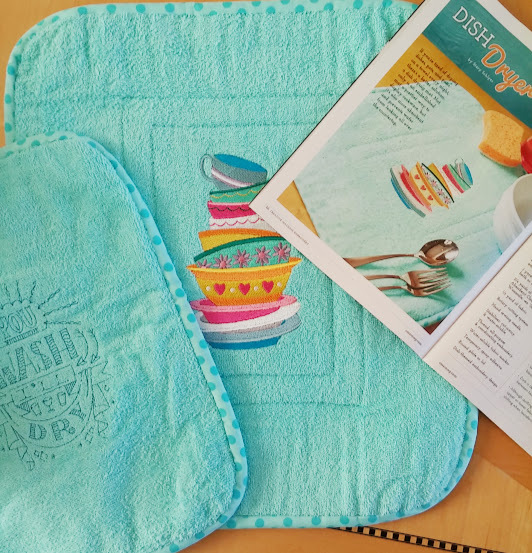 If you happen to pick up the latest issue of Creative Machine Embroidery (MarchApril 2015) you’ll be able to see my latest project: Dish Dryer. That’s right, no more using towels or having water leak all over your counter when you’re drying dishes! I love this article so much because it’s cute and functional and gave me the opportunity to try a very cool, super absorbent material for the interlining (commonly used in cloth diaper making)…. I love working with new products! The instructions list a number of different sizes to make depending on your needs and best of all – you don’t need an embroidery machine to complete the project (but it definitely makes them much cuter and perfect for gift giving). Hopefully you’ll have as much fun making these as what I did creating them! This entry was posted in General on February 13, 2015 by stacy.